AK Acres Popcorn Company is located in the rural town of Imperial, Nebraska. 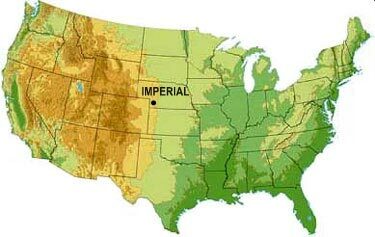 Imperial serves as one of the primary agricultural centers on the high plains and is home to a diversified sector of agricultural businesses. AK Acres Popcorn Company contracts all of its popcorn production in the fertile plains of southwest Nebraska, northeast Colorado, and northwest Kansas. The dry climate in combination with warm days and cool nights makes this area of the United States an outstanding environment for the production of high quality popcorn. In addition, this land is located above a large underground aquifer that provides the popcorn crop with an abundant source of water. The fact that our production is 100% irrigated means a stable supply even in years of drought.